A medieval jug worth £250,000 has gone on display at the Wardown Museum in Luton for the first time after being rescued from an overseas buyer. Last year the Culture Minister stopped the export of the "Wenlok Jug" but Luton Borough Council had to buy it. 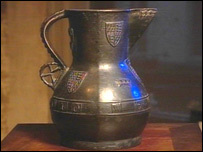 The 14th Century bronze jug carries the inscription "My Lord Wenlok". This refers to William Wenlok a canon of St Paul's Cathedral or his great nephew John, the first Lord Wenlok who both had close ties with Luton. The leader of Luton borough council, David Franks, says the Wenlok Jug may have gone walkabout for several hundred years but he is delighted it is finally home. Luton Borough Council won an epic battle with New York's Metropolitan Museum of Art for the jug.